Local artist Reinaldo Gil Zambrano, along with arts nonprofit Terrain, will hold the city’s first-ever Spokane Print Fest. The free event on Friday includes live demonstrations of a wide array of printmaking techniques by students and instructors from Eastern Washington University, Spokane Falls Community College, Gonzaga University, the University of Idaho, Washington State University, as well as Coeur d’Alene’s Emerge Gallery. The obstacles to seeing, enjoying and practicing printmaking can be insurmountable for most lay people and aspiring artists, according to Zambrano. Zambrano is among a growing community of avid printmakers seeking to change all that. The EWU adjunct art instructor used funding he won from a Spokane Arts Grant Award last year to open his own print shop, RGZ Prints. Helping to establish Spokane’s first annual Print Fest furthers his vision to educate others about traditional printmaking. In addition, Zambrano will use the event to launch the opening of a new, bigger venture with the artists of Millwood Print Works – Thom Caraway, Bethany Taylor, and Derek Landers – and local comic artist Derrick Freeland. The group plans to share resources, offer classes and fuel more interest in traditional and contemporary printmaking by starting the new Spokane Print & Publishing Center downtown. Zambrano met his fellow Spokane Print & Publishing Center co-founders through community-building art events. They all realized they shared the same dream: to make the art of printmaking more accessible to more people. “Together we will cover all kinds of printmaking, from leather press to intaglio and relief, to DSL printing and illustration work,” Zambrano said. To add to Spokane Print Fest’s celebratory atmosphere, there will be live music, beer to purchase and networking at the Washington Cracker Co. building from 5 p.m. to midnight. In conjunction with the festival and First Friday Art Walk, Terrain Gallery, also located in the Cracker building, will open a new exhibition for festival audiences to visit, and that will remain open all month. The show, Tangible Gestures, co-curated by Zambrano and Carl Richardson, will feature works by 35 printmakers, both local and national. 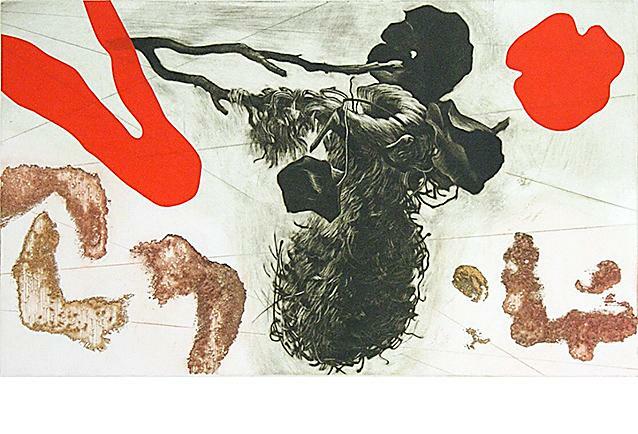 Styles include relief, intaglio, silkscreen, installation and lithography. “We curated the printmaking show, so you can see professional work done with many of the same techniques that are being demonstrated in the other space for the festival,” Zambrano said. Tangible Gestures is also featured as one of the stops for SATURATE. SATURATE is the month-long push by Spokane Arts and local venues to feature artists of color. Terrain Gallery will also host a series of printmaking workshops throughout the month. The workshops will take place every Saturday in April from 10 a.m. to 12 p.m. and can be purchased for $50 in advance from the Terrain website. Zambrano will teach relief, Margot Casstevens will demonstrate dry-point, Mary Farrell will show how to produce monotype and Kevin Haas will teach smart plate lithography. Works by those instructors can be viewed in Tangible Gestures. Zambrano’s own works often deal with the concept of home and identity. He grew up in Venezuela and lived in Costa Rica before attending graduate school at the University of Idaho to study drawing. He was always fascinated by storytelling and had planned to be a children’s book illustrator. But after being exposed to printmaking in grad school, Zambrano had an epiphany. Published: April 4, 2019, 5 p.m.